Whether you enjoy romantic weekend breakfasts or look forward to closing out the hectic week with a family dinner on the patio, consider the beauty and convenience of an outdoor kitchen. Cutting Edge Landscape & Design is the premiere choice for outdoor kitchen contractor Eugene Oregon. From grilling gurus to masterful culinary artists, we will create a unique outdoor kitchen to satisfy all of your cooking needs. We take pride in thinking outside of the box and designing an imaginative haven for our clients and their needs. A barbecue chef, for example, requires more than just the grill to execute succulent meats and savory grilled vegetables. Incorporating an outdoor stove enables the conjuring of tangy barbecue sauces within close reach of the grill itself. If you savor the Mediterranean flavors of gourmet pizzas, delight guests at your next patio pizza party as you extract the pies from an outdoor wood-fired pizza oven. Tell us which cooking projects excite you, and we will design a unique outdoor kitchen plan that will facilitate those endeavors amidst the scenic backdrop of your patio garden. No matter what your dinner plans are, the meal comes together through a series of steps. Why continue to carry out all of your chopping, mixing and other preparatory tasks indoors, only to be faced with multiple trips to transport everything outdoors to the grill or table? We will put an end to inconvenience and bring your epicurean endeavors outdoors into the fresh air ambience and botanical beauty of your patio. 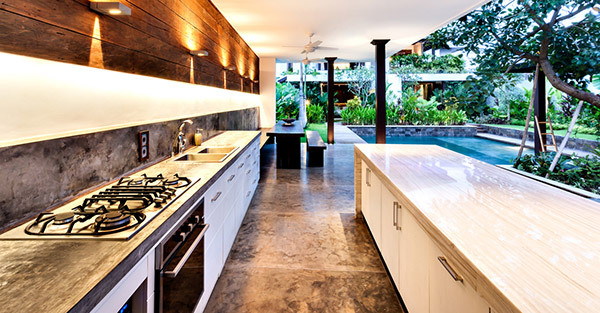 Today’s outdoor kitchens are designed with food preparation needs in mind. A countertop allows you to chop your onions and garlic and drop them directly into the stovetop pot for the tomato sauce that will grace the chicken to be cooked on the adjoining grill. Storage needs are also addressed with built in cabinets and drawers for cookware, utensils, gadgets and nonperishables. We can equip your outdoor kitchen with a sink, allowing you to fill a pot with water for boiling pasta or to wash fresh herbs and vegetables harvested from your backyard garden before chopping them and stuffing them into those breakfast omelets. In addition to plumbing, outdoor kitchens can also be outfitted with electrical power to enable use of small appliances such as a countertop blender for summer smoothies and autumn soups or a coffee maker for sunrise breakfasts. The addition of a refrigeration unit preserves perishable ingredients and chills beverages. From start to finish, it is conceivable to cook an entire meal without setting foot indoors. This equates to more time spent with your family and friends who are gathered outdoors on the patio and less time running in and out of the house. When designing your culinary haven, outdoor kitchen contractor Eugene Oregon will compliment your landscape and home’s design style. We can complete your outdoor cooking and dining environ with a new deck, paving stones and attractive stone walls. Servicing Eugene Oregon and the surrounding area, we at Cutting Edge Landscaping & Design offer dependable and professional service and innovative creativity to fulfill all of your outdoor beautification needs. Contact us today for a free estimate, and let us design your perfect outdoor kitchen.